Edward Allen Redinger passed away peacefully on January 4, 2016 at the age of 91. He was born on April 25, 1924 and was a lifelong Olathean. He was born on a farm, attended a one room elementary school house and graduated from what was then J. P. St. John Memorial High School. Always industrious, as a youth Ed delivered milk on his bicycle to earn money. He attended the University of Kansas before he enlisted in the Army. During World War II, he was a topographic engineer and printed invasion maps. When he was stationed in England, he met his future wife, Joan. They were married in Cheltenham, England, a union that lasted almost 65 years. They had one son, Alan, and also raised their niece Becky from the time she was ten. Joan, Alan, and Becky have all preceded Ed in death. Ed proudly owned and operated Burns Printing in Olathe for many years. Ed started working there while he was in high school and returned to Burns when he was discharged from the military. He was very active in the community both personally and civically. He coached Little League baseball, was a long-time member of the local VFW, Kiwanis, Optimists, Chamber of Commerce and the American Legion Post 153. He served 13 years on the City Hall Board of Zoning Appeals and set up the printing program at Millcreek Vocational School. He was named an Honorary Alumni Board Member by what was then Mid-America Nazarene College, he served many years on the board of Old Settlers and was also active in his local and state Traveler’s Protective Agency. 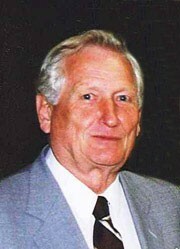 He was also a Jaycee and served on the Chur, Switzerland Sister City Committee for many years. Ed was named to the Olathe Public Schools Alumni Association’s Wall of Honor in 2011. After the business was sold to Alan, Joan and Ed wintered in Arizona and Florida for several years. They traveled extensively, often going back to Joan’s hometown in England. Ed organized nearly 60 reunions of WWII Topographical Engineers. They would meet in different cities annually, both in the US and abroad, for a week of reminiscing and having fun. Ed and Joan, along with several other couples, hosted an annual Holiday Party at the American Legion. Ed lived his life actively and always loved Olathe. He got his wish to live and die where he chose…at home in the city he loved. His sister, Betty and daughter-in-law Mary Ann survive him as well as a host of nieces, nephews and friends. Special thanks go out to the Steve Cunningham family and to Candy and Marty Birch who were faithful friends and neighbors and helped Ed throughout his later years. Services are scheduled to be held on Saturday, January 9th at Penwell-Gabel Funeral Home, 14275 South Blackbob Road, Olathe, KS. Visitation is at the funeral home from 1 pm to 2 pm followed by the memorial service scheduled for 2 pm. After the service, burial with military honors will take place at Oak Lawn Memorial Gardens, 13901 South Blackbob Road, Olathe. A reception will be held at Penwell-Gabel immediately after burial. Donations in Ed’s memory may be made to your charity of choice. Add your memories to the guest book of Edward Redinger. Thinking of you today Uncle Ed, with special memories of the good times we had when we all got together with you and Aunt Joan, on the many occasions you visited the UK. Especially remembering the one time Mike and I visited you in your home and the wonderful way we were looked after, meeting relatives and friends. The amazing trips out, showing us your favourite places, in the country you loved, we will always treasure. Rest In Peace. I am Lola VaughnWalker and I think I was a schoolmate with Ed in 1931. I lived on a farm we rented from a Doctor Mabee. My two sisters and I went to a one room school and Miss Dill was the teacher. My sister read Ed's death notice and called me to say my old boyfriend died. She recognized his name but I was 7 years old and couldn't have had a boyfriend. My father died in 1931. He had raised a bull cakf but it got older and goured him in the spring and my Daddy dies in Nov. with a ruptered aorta.Mother was a farm woman with a grade school education. We moved to K.C. Kasnsas to be near her family.She was a wonderful, loving Mother.She made garden,canned everything and raised us on very little money. I am 91 years old my sister is 90 and my other died 4 years ago. I had a wonderful Husband who died 2011 after 67 years of marriage. I have been blessed. I have 30 grandchildren,34 great and 2 great. I hope this didn't bore you but maybe Ed's sister went to the same school. My e-mail is Whipwill27@msn.com if you would like to correspond. Please accept my sympathy at your loss.Just remember the happy times. Ed was a very special person of our family. I remember all the great times my parents had visiting Ed and Joan, and Alan was like a brother to Doug and I. I know our Mom and Dad were there with Alan, Joan and Becky to welcome Ed into the Kingdom of Heaven. We will miss all of them very much until we are all united in Heaven. I am grateful for the life of Mr. Redinger. Thanks to his service and to the service of others in our armed forces, my family and I have been able to lead our lives in freedom and peace. Ed was such a wonderful brother...always thinking of others with his generosity. I and many others will miss him so much. Uncle Ed was the best man I knew. He had a generosity of life and spirit that I admire and strived to learn from. I will miss him. Such a delightful gentleman. I enjoyed visiting with him when I was in my private practice. One of the finest "old Olatheans", Ed never met a stranger. My comfort is extended to his family.